One of the favorite baby foods in this house has been butternut squash. How wonderful to be able to turn out your baby’s own food where you know there are no additives except the love you put into it. If you grow your own butternut, all the better. And if you don’t…butternut is available in most areas of the country year-round. Making your own baby food is so simple that the makers of those little one-serving jars of food would surely never want you to know. Wash and dry the outside of the squash. Slice off the two ends and split the butternut squash in half longways. Lay it on an oiled cookie sheet with sides. Bake at 350 degrees for about 45 minutes, depending on the size of the butternut. The squash is done when there is no resistance as you pierce it with a sharp knife. Remove pan from the oven, allowing the butternut to cool enough for handling. Scoop out the soft flesh. Puree it in a food processor or blender until smooth and silky. 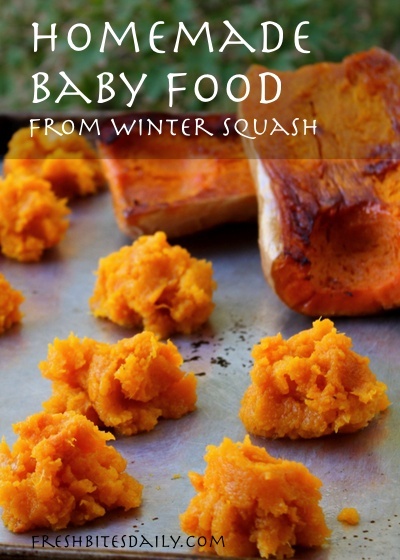 A scant amount of sea salt improves the flavor of your butternut baby food. There should be need for nothing else, especially for a young baby. The squash itself is sweet and may have become sweeter as it baked. This is called caramelizing. If you are preparing this food for an older infant you may want to add a smidgen of butter or a scant sprinkle of cinnamon when you serve it. Overall, butternut squash stands well on its own as a baby food. Lots of happy baby faces have proven that. When you are preparing butternut puree just for baby, you will end up with a quart or more of puree. This will keep in the refrigerator in a tightly covered container for a couple of days. Do not push past this point. You do not want to risk bacteria getting started in your precious baby’s food stash. Freezer to the rescue! Spoon out servings onto an oiled cookie sheet just as you would spoon out cooky dough. Freeze for a couple of hours or until the mounds of squash are frozen enough to handle. Pop the squash mounds loose from the cookie sheet. Work quickly. Place into the freezer containers of choice and return to the freezer. The quality of this butternut baby food stays prime for about three months. he simplest way to heat your butternut squash is to thoroughly defrost it first. “Of course!”, you say. “But what if I forget to pull it out of the freezer?” No problem. Place the frozen mound of butternut in an egg poaching cup and thaw it over hot water. Another take on the egg poacher is to place the butternut mound in a coffee cup and put the coffer cup in a small saucepan with two to three inches of water. Keep the water at a simmer. Stir the squash from time to time for even heating. Depending on the size of the butternut mound, ten minutes will probably do the job. At some point baby will stop eating pureed food, going for much more interesting chunky stuff. You may have a significant amount of butternut puree in the freezer. 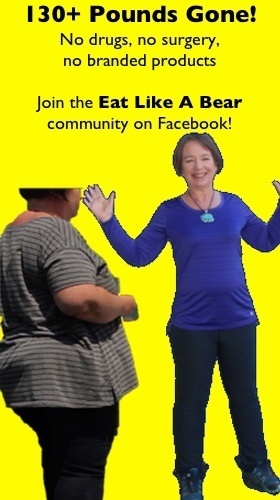 Eureka! Start thinking of butternut bisque, squash bread, butternut molasses cookies. There are loads of options for using up your hard-earned butternut baby food when baby moves on to table food. It’s a bittersweet moment as you probably already know.